The Jane Fonda Kit House -- aka JF-Kit -- is an experimental home of the future that explores ways people can produce their own household energy while keeping fit. The house enables residents to turn their kinetic energy into power for cooking, watching TV or cleaning the house! Designed by Spain-based Elii studio, the off-grid JF-Kit is made for the citizen of the future who is healthy, active and energetically self-sufficient. JF-Kit is part pop-up gym, part self-sufficient off-grid home. The interior features a line of ‘domestic fitness furniture’ that enables residents to produce energy by pedaling a bike, doing sit ups, or even watering the plants. Kinetic energy generators turn exercise into energy that is used to power appliances. It’s a win-win situation – by being active and exercising, the residents can generate their own power. The JF-Kit House is a great project that raises awareness of the energetic and economic costs involved in mundane activities. The power producing home could also monitor domestic energy consumption and eventually create ‘community energy networks’. JF-Kit is part pop-up gym, part self-sufficient off-grid home. The interior features a line of ‘domestic fitness furniture’ that enables residents to produce energy by pedaling a bike, doing sit ups, or even watering the plants. Kinetic energy generators turn exercise into energy that is used to power appliances. It's a win-win situation - by being active and exercising, the residents can generate their own power. 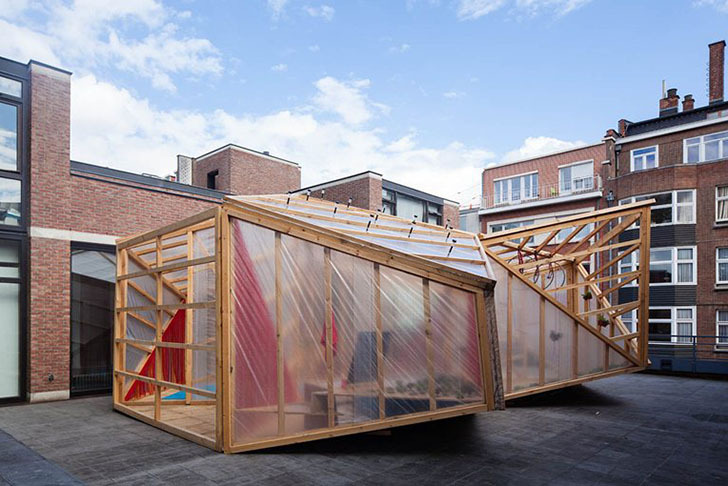 The JF-Kit House is a great project that raises awareness of the energetic and economic costs involved in mundane activities. The power producing home could also monitor domestic energy consumption and eventually create ‘community energy networks’.